After work on Friday, Roger and I frantically ran around trying to accomplish all the things I'd planned to accomplish that morning. Since we'd gotten back from a gallery opening at 2am, I should have known I wouldn't wake up at 5am to pack and shower, but I didn't, and so we spent the 6-7pm window picking up prescriptions, showering, packing and scarfing down pizza before heading up to Albany to see our friends Rachel, Shelby, and Mike. We stayed at Shelby and Mike's house that evening, and admired their new air mattress. We intended to leave Albany at 8am, but ended up picking Rachel up at around 8:45 (noticing a trend here? ), before getting Dunkin' Donuts. We had mostly pumpkin flavored coffees, and they were delicious, and no, I'm not thinking about what was used to flavor them. I'm just enjoying the memory. We caravan-ed up to Burlington, taking the ferry over Lake Champlain. It was a surprise to us when Shelby's gps led us there, but it ended up being a lot of fun, and a nice, quick ride. Once we arrived in Burlington at around 1pm, my brakes failed as Roger was driving, and we nearly killed a puppy. Then we stopped at our campsite, the North Beach Campground, and set up the tents. While we ended up having a nice time at the campground, I wouldn't recommend it. It was really crowded with no privacy (the tents and RVs were just set up in a large field, with few trees in between), and the security guard told us we were being too loud in our tent at 11pm. I can't offer a better suggestion, but if anyone has one, I'd love to hear it. Shelby had the good sense to blow up her mattress in the tent, and while it took up around 1/2 of the tent (it comes up to the blue line in the picture on the right), it fit perfectly and seems to have made for a wonderful sleeping treat. We headed back into Burlington (taking Mike's car, though the site is close enough that you can probably walk into city center without much of a problem), and since we couldn't immediately find m y favorite restaurant from Middlebury, American Flatbread, we stopped in at Mirabelle's for lunch. American Flatbread is right around the corner, as it turns out, and if you're there for two meals, it's absolutely worth checking out. Still, Mirabelle's was fantastic, and extremely well-priced. I had eggs benedict with corncakes instead of English muffins and chili peppers in the hollandaise sauce, and at $11, it was amazing. Our stomachs full, we wandered briefly around the Church Street Market. My only real regret about getting to Burlington so late is that we didn't have much of a chance to walk around, but what we did see of the market was lovely. They had a jazz band playing, and there were some cute shops and restaurants. We looked up the Magic Hat Brewery, which we had planned the trip around, and walked the 3/4 of a mile to the location. Unfortunately, we had the wrong location, and came upon a large building with a gallery and yoga studio where we thought the brewery was. We did see some of the 2010 South End Art Hop, which was a nice surprise, though we only visited one open studio. I'm always amazed at how many people turn out for art walks, and this was no exception. Since it's only once a year, people seemed to really go all out for it, and the Art Hop logo was all over. 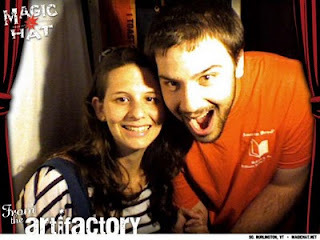 We turned around, did a little shopping, and then got back in the car to go to the Artifactory, the part of the Magic Hat Brewery where they give tours. We've been to a few breweries now (Shipyard, Brooklyn, Bar Harbor Brewing Company), and while I don't like them quite as much as the wineries we've been to, they're often a lot of fun, and Magic Hat was by far the best I've seen yet. Our tour guide was hilarious and really knowledgeable, and the free samples seemed to be unlimited. I think we all tried each of the nine they had on tap, and some of us went back for sec onds. They also had a photobooth, a gift shop with glasses, 12-packs, and sleeping bags, and the company runs a few big parties each year. I definitely approve. After, we ran into a grocery store for hot dogs and s'mores, and headed back to the campsite for a nice evening around the fire enjoying each others' company. One day of sleeping not on Shelby and Mike's mattress, but rather on the damp groun d, convinced me I needed at least one of two things: an air mattress or an under-tarp for the tent. I ended up buying the former on sale at LL Bean when I headed home (one of air mattresses we borrowed from my parents, in addition to being 30 years old and taking about 20 minutes to blow up, has a leak, so I feel this was a practical investment). It really wasn't so bad, but I was a little grumble-y waking up and getting dressed before going to the gas station to pick up brake fluid. The brake fluid seemed to do the trick, so we headed out for Ben & Jerry's, witnessing some of a triathlon on the way. Unfortu nately, it became clear that the brake fluid was leaking, and so it only did the trick for about 10 minutes. We hobbled our way to the factory, and enjoyed the cute, if short, tour and free samples before saying goodbye to Shelby and Mike for the weekend. In the lot, we filled up with more brake fluid, which lasted ap proximately 10 minutes, and made the three-hour trip to Albany. During the trip, I remembered I'd left my glasses in Shelby's glasses case, and she and I played phone tag. She's being a fantastic friend to the forgetful and mailing them down to me. We dropped in at LL Bean (where they didn't have my mattress, but where they advised I buy it online, since the salesperson likes it better than the Bean equivalent - I love honest salespeople! ), stopped by Rachel's lovely pre-war apartment to take care of her cat, and went to eat some very good Indian food at Shelby's suggestion, Ghandi Restaurant. We almost went to another restaurant, called Royal India, but decided we like our world more post-revolution, and had a delicious meal of saag paneer and chicken and lamb korma. We left Rachel to her studies, and filled up the brake fluid one final time before heading back down home, where we found out my father could fix the leak in my brake line, and where we watched Mad Men while eating ice cream. A lovely ending to a lovely weekend!